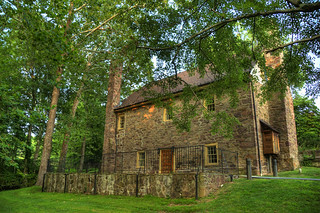 Shot of Cabell's Mill in Centreville, VA.
Cabell's Mill was probably built by Willoughby Newton between 1753 and 1759. It has been known at different times as Newton's Mill, Rocky Run Mill, Triplet's or Pittman's Mill and Sandy's Folly. By 1850, the mill was owned and operated by Edward Caple and on a military Civil War Map it is noted as "Copel's Mill." As there was not a standardized system of spelling, we now have the current misnomer, Cabell's Mill. Through its long history, the mill ground various grains and then sumac for the local tanning and dyeing industry. It also served as an informal meeting and gathering place for local farmers. By 1906, the mill had been converted into a sawmill. All mill operations had ceased by 1929 when a series of owners renovated the structure, diverted Rocky Run and filled in the millrace. The wheel was not, as many have thought mounted on the building parallel to the stream. Instead the millrace brought water from upstream down through what is now staff parking to hit the top of the wheel on the side of the building opposite Walney Road. Ellanor C. Lawrence, wife of U.S. News and World Report founder and publisher, David Lawrence, purchased the mill in 1944 and used it as a guesthouse, providing a rural retreat for many Washington notables. The mill was also the site of Mr. Lawrence's weekly news broadcasts on the NBC Network from 1945-1970. Under the terms of Mrs. Lawrence's will, the Fairfax County Park Authority received the mill, the miller's house and the surrounding woodlands that now comprise Ellanor C. Lawrence Park in 1971. In 1980 Park Authority completed major renovations to the building and it was opened for public use. Cabell's Mill is listed on the Fairfax County Inventory of Historic Sites and with the Virginia Department of Historic Resources.